More than a decade ago, multi-talented singer, songwriter and guitarist, Steve Oliver burst onto the contemporary jazz scene with a sound so fresh, so positive, and bright, that he immediately became a favorite on radio stations with songs like "West End" and "Highway One." Oliver is renowned throughout the contemporary jazz world for his charismatic one on one relationship with the audience and a wild array of sonic delights that include soulful lead vocals, snappy guitar lines, playful ‘vocalese’ and wonderworking with the synth guitar. Oliver’s latest release, his first ever all-vocal album, “Pictures and Frames,” is his first official venture into the pop format after nine albums and over 15 years of dominance on the Billboard Contemporary Jazz chart. Marion Meadows is an internationally renowned saxophonist and composer. His ﬁrst RCA release, “For Lover’s Only,” was a huge success followed by his ground breaking “Keep it Right There” album. 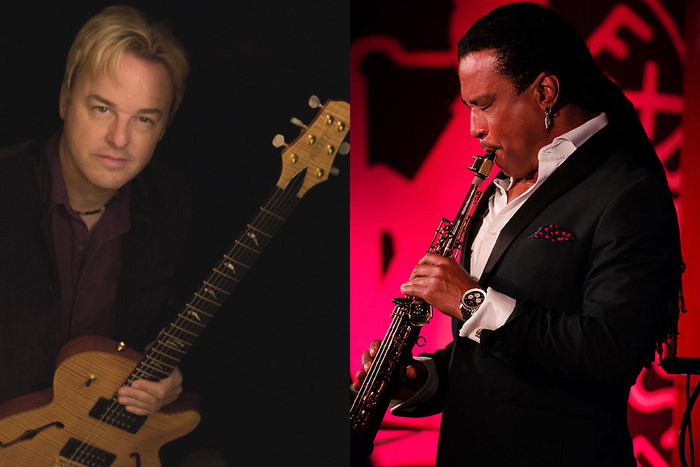 He became a staple of the contemporary jazz format with his subsequent recordings, which include; “Players Club,” “Dressed To Chill,” “Secrets,” “Whisper,” and his current release,” Soul Traveler.” Join us for an evening of smooth jazz at its best in the intimate setting of the Studio Theatre.